A landscaped garden and tall wooden doors welcome you to the courtyard entry, which reveals a villa that is a showcase for sophisticated, yet relaxed hacienda coastal architecture. Casa Corazon interiors feature lots of colourful touches that include furnishings and artwork obviously from Mexican talented artisans. Beautiful hand made and polish cement flooring, a generous use of floor-to-ceiling magnificent hardwood and beams enrich your living experience. 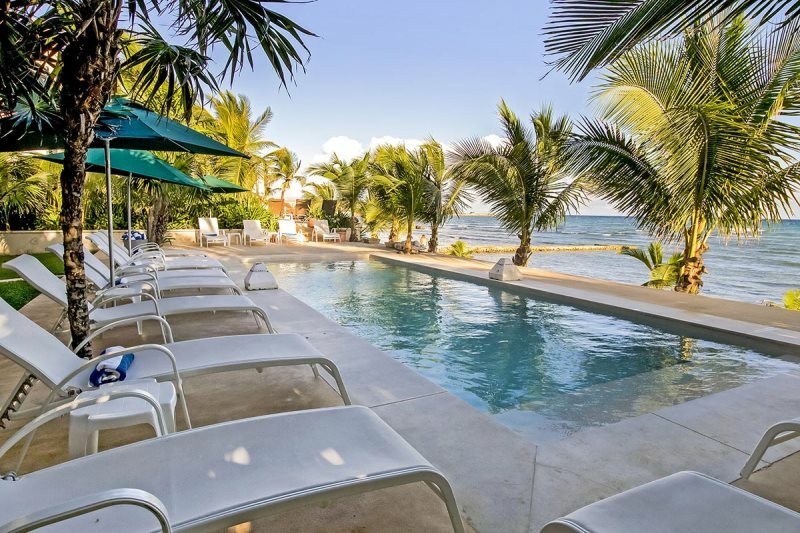 This Puerto Aventuras private Villa features and exude a feeling of sophistication and elegance, sweeping Caribbean sea views, spacious covered terraces, unwind in the serene environment of the sun-drenched courtyard and enjoy the refined services and amenities. 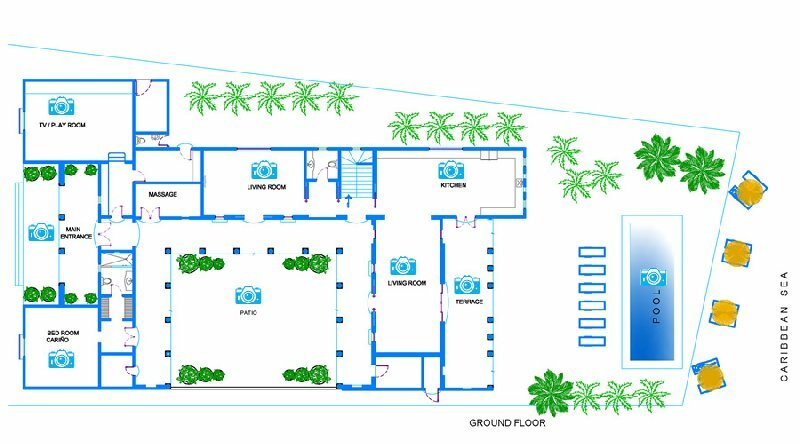 On the ground floor, off the courtyard, two living room areas, one has a large flat screen TV with satellite. The gourmet kitchen comes with all the modern conveniences. Ten bedrooms with en-suite bathrooms accommodate up to twenty guests at Hacienda Corazon. This rental villa is child friendly. Three ocean front suites with king beds and balconies are located on the upper level. On the north wing, there are two more suites. The west wing features four suites with views of the native tropical views. Dinning in the comfort of this rental villa can be a very pleasurable culinary adventure, a gourmet chef can custom-cater a memorable meal for your group. The endless vistas of the ocean and the Bay of Fatima combined with lush, mature landscaping make these residence even more exceptional. Bedroom 9 - Mi Corazon: 2 Twin beds (pushed together to make King), En-suite bathroom with stand-alone shower, Air-conditioning, Safe for valuables. Gourmet chef service for breakfast, lunch & dinner (cost of food & beverages extra). *Other services for a fee, advance notice is required. Only registered guests staying at Hacienda Corazon, Puerto Aventuras are permitted on the property. Hacienda Corazon is rented with a minimum of 7 suites (excludes holiday weeks) fewer bedrooms or different arrival days may be possible depending on the season. Please inquire.